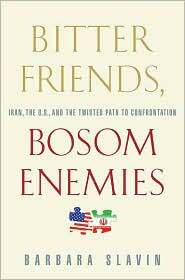 Barbara Slavin, an expert on U.S. foreign policy and the author of Bitter Friends, Bosom Enemies: Iran, the U.S. and the Twisted Path to Confrontation, will speak at on Mar. 16 at 5 p.m. in Devlin Hall, room 008. A nonresident senior fellow at The Atlantic Council specializing on Iran, Slavin has served as assistant managing editor for world and national security of The Washington Times and as senior diplomatic reporter for USA TODAY. She has reported from Iran, Libya, Israel, Egypt, North Korea, Russia, China, Saudi Arabia and Syria. Slavin is a regular commentator on U.S. foreign policy on National Public Radio, the Public Broadcasting System and C-Span. Sponsor: Islamic Civilization & Societies Program. This entry was posted in Guest Authors and tagged foreign policy, Iran, Islamic Civilization & Societies. Bookmark the permalink.